During the winter months, there are several things to keep in mind when caring for your typical houseplants. Even though these plants are located inside, their internal systems slow down too, just like plants outdoors, though the change is usually not as drastic. A few main things to consider are light, temperature, and water. Sunlight during the winter is greatly decreased from the amount in the summer, sometimes by even 50%. It is important that your indoor plants still receive adequate light during this time. You can help them out by moving them closer to a southern or western-exposed window. You can also add artificial light, provided by something as simple as a fluorescent bulb. If you choose to use bulbs, be sure to keep them 4-12 inches away from the plant, and turn them off at night. The dark period during the night is just as important as sunlight and is required for photosynthesis. Generally, most of the common houseplants do well at an indoor temperature of 65-75°F, with nightly temperatures about 10 degrees lower. While being close to a window for sunlight absorption is helpful, but be sure your plant is several inches away from the window on cold nights. Also, keep plants away from drafty areas and heat sources. Many times, house plants are overwatered, not just in the winter, but all year. You can tell if your plant needs water by sticking your finger 2 inches into the soil. If the inside, not just the surface, is dry, it is time to water. 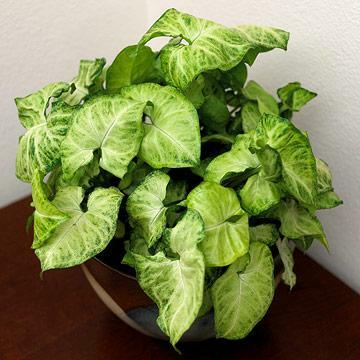 Unless otherwise specified for your particular plant, most houseplants will do best if they are allowed to almost completely dry out prior to watering. • Why Won’t my Grass Grown in the Shade? • How Can I Control Pests Organically?